These Optical Splitters will amplify and duplicate the digital audio signal from a source device to facilitate multiple output connections. This device provides an effective solution to distribute digital audio. This 3 Way Optical (Toslink) Splitter will take a single digital audio input, then duplicate this through each of the three outputs. Can be powered via USB or mains power (with an optional USB power supply adaptor). If you're looking for a solution to allow simultaneous connection of multiple audio systems from a single source device, this 5 Way Optical (Toslink) Splitter is the answer. 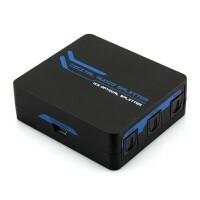 Can be powered via USB or mains power (with an optional USB power supply adaptor).